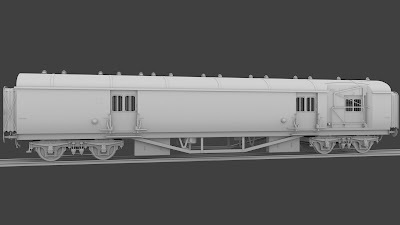 So we thought we'd keep you in suspense a little longer before showing the GWR Saint actually in game (and also we've not had time to take any screen shots!) 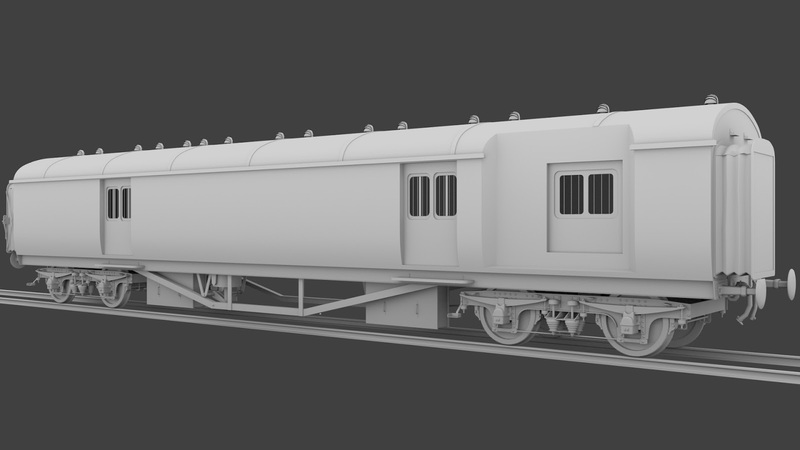 but today we're going to do a Work In Progress update on the accompanying GWR Travelling Post Office (TPO) coach. The first task was to hit the books and decide which version to make. 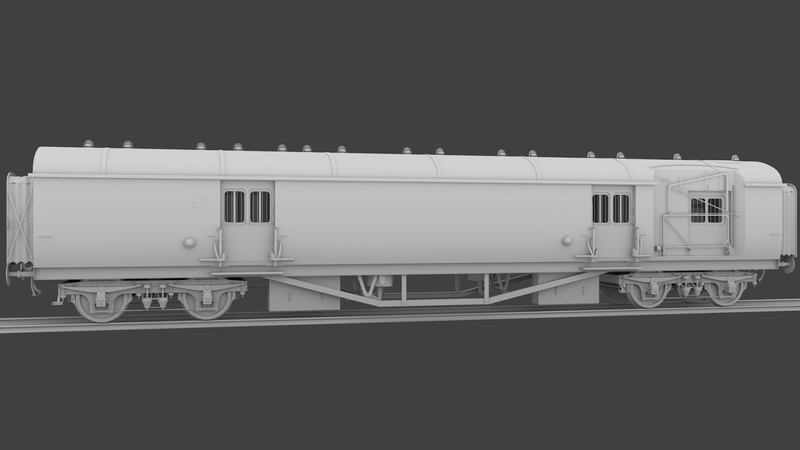 We ended up choosing the Diagram L.21 which served the West Coast of England from 1933 until 1959 as we had good reference images and also there were 3 coaches of this type, no. 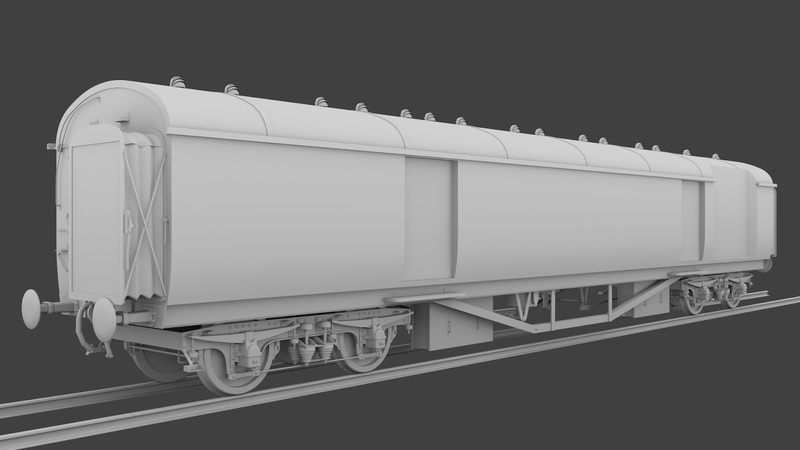 's 793, 794 and 795, which is the most amount of any other types we considered (others diagrams had 3, 2 or even just 1 coach). The basic coach outline took shape pretty quickly. 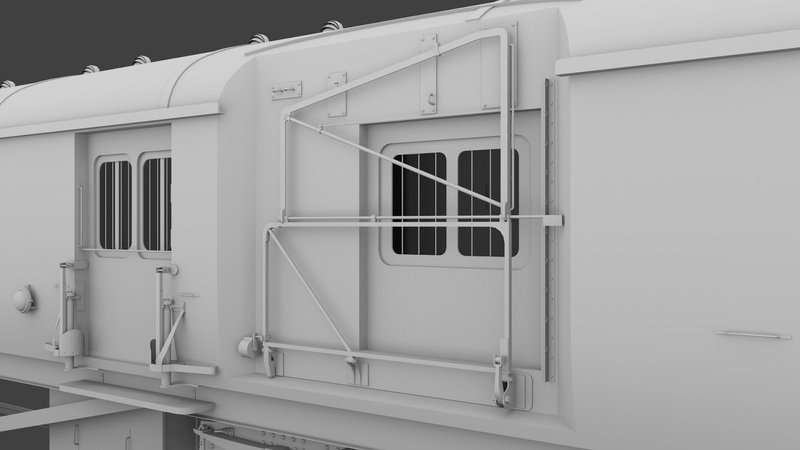 The next task was to cut out the doors and add some details to them. There are 2 doors on each side, those on the LHS side opening to allow the mail bags to be swung out for dropping off, as well as 2 doors on the RHS side just for loading parcels (and crew!) and also the door behind the net where the bags being collected fly in at a great rate. The bags can weigh anything up to 60 lbs each which when hitting the net at up to 40mph carry quite some force. 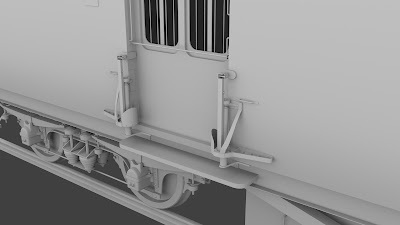 Next we modelled the details of the "traductor arms". These are used to hang the packages out from the side of the coach for dropping off into the net on the ground - 2 either side of each door, so 4 in total. Once it's all animated and scripted the coach and apparatus will allow for the dropping off of 0 to 4 bags and the collection of 0 to 3 - this varied in real life based on the needs of the location. 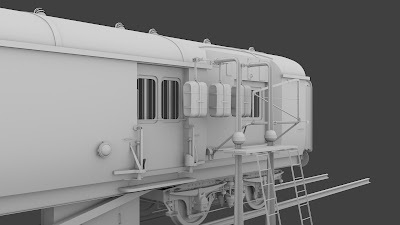 We have had some very useful images and advice from someone who works on the TPO's in preservation to whom we are very grateful and we were also able to visit coach 814 at Didcot and have a good play around with parts of the coach apparatus to see exactly how they functioned which has been invaluable when modelling (and of course we visited Lady of Legend while we were there). 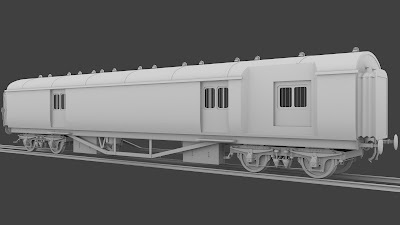 Next to be modelled was the net framing, again based on photographs, diagrams and measurements we were able to take from 814. The coach was completed with the addition of the side lights which will turn on and off during the exchange process if it takes place at night. 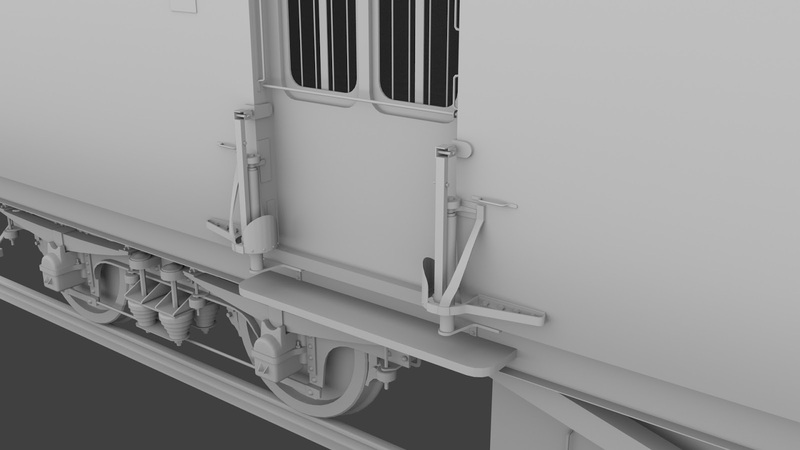 The coach is only half of the operation and next we modelled the ground apparatus - the hanging bags for collection by the coach's net and the ground net to drop off the hanging bags into. Oh and of course some nice plump mail bags as well. The apparatus is actually positioned the other way around - ground net first and then hanging bags - this image was just taken as we were working on the models and making sure scaling etc was correct. Then the moment of truth... would everything line up properly?! It did! 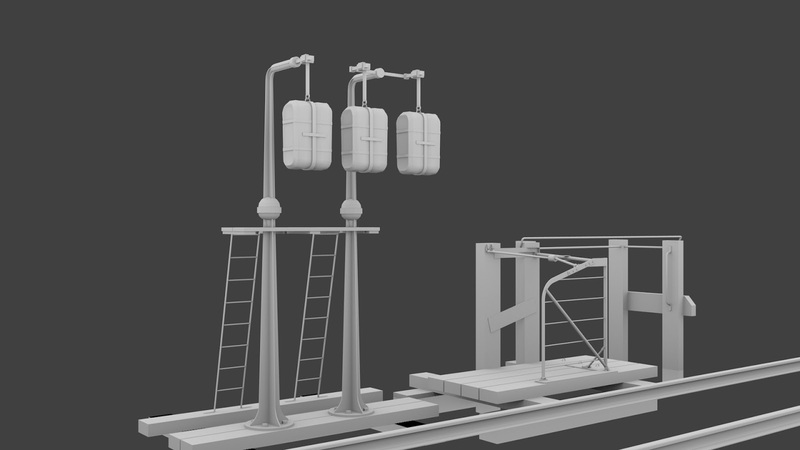 As before these are WIP modelling images and when the exchange is taking place the doors are opened, etc. This was purely to make sure that everything lined up. 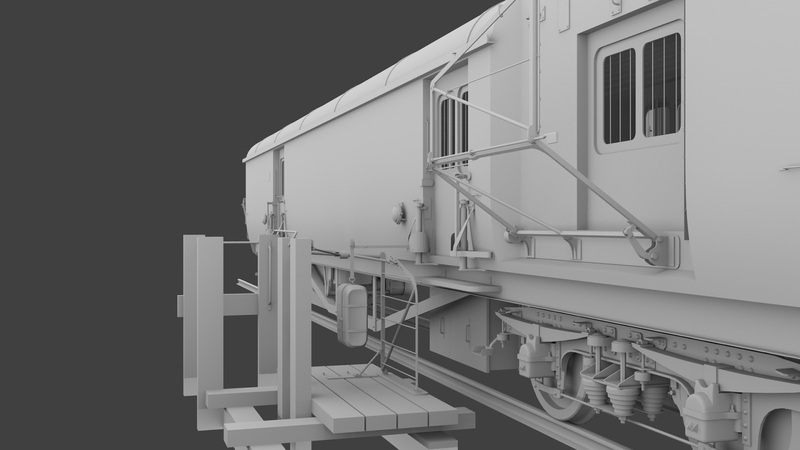 Still be added are the ropes and nets for both coach and ground apparatus and then it's time to exercise the excellent physics capabilities of Blender as we start throwing packages into nets at high speed to record the animations needed for Train Simulator. Looks very interesting - nice addition and will follow the development on this one.